A severe and most punishable offense has been perpetrated against our glorious leader. It seems as though some right-wing obstructionists have engaged in malfeasance to embarrass Dear Leader and make him look as incompetent at hitting mid-range undefended jumpers as he looks at managing the US economy. It is bad enough they obstruct to stop his People's Agenda, but, to now obstruct his basketball game is most offensive, indeed. I cannot say for sure if they warped the ball or if they bent the rim (same tactics used by the evil corporate amusement park games operators) in an effort to humiliate Dear Leader, but, a congressional investigation and appointment of an independent prosecutor should be convened ASAP to correct this injustice. 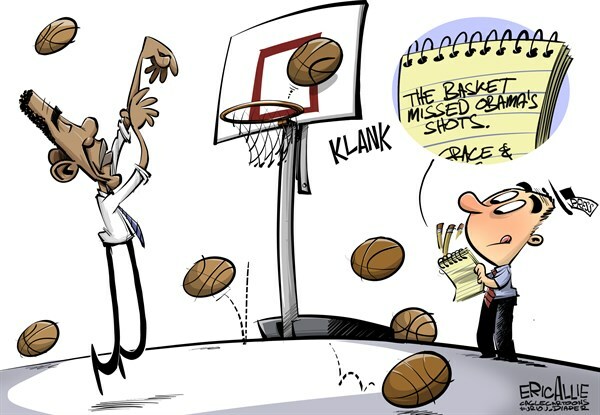 Comrade El Presidente, as you point out, it's all too obvious Barack Hussein Obama's (PBUH) ball is defective. Dear Leader has proof of his unrivaled skills as a person of exceptional ability. Parroting comrade Chris Matthews, after all, the man is perfect! This is a clear example of media inaccuracy. I understand that our dear leader actually made 24 out of 22 baskets; twice the ball bounced back into the net after his extremely competent throws. We shall continue to praise our dear leader, and we must remedy the inaccurate media by sending them to re-education camp, so they learn to print what they are told. Those darn Republicans must be using the old hoodoo voodoo black magic mind control trick again. Comrade Margaret - are you referring to the infamous Jedi Balls Meld trick? They did that too?!!! Ohhh! Those darn Republicans. Jedi Mind Meld ™ . . . . pshhht. Cower in my awesomeness.